Staying on the subject of coping with life’s challenges and changes, this spunky frog inspires me. Some challenges are huge, the odds are stacked against you, and you are running out of resources. And yet because you want to win through you fight on. This frog is not allowing himself to be overwhelmed by the problem – he has found a way forward and is taking hold of it with all his strength. Stuff happens . . and yet . . . Thought for the day on the radio at 7.45 launched the theme – bad things happen to good people and good things happen to bad people. Our beliefs and expectations for life are constantly challenged. BC and I heard this as we travelled by car to the reunion of Spurgeon’s Scholars – people who were brought up in Spurgeon’s orphanages. BC has supported Spurgeons for many years and offered to help out at today’s event. What an inspiring place to be. C. H. Spurgeon (1834-92) was England’s best-known preacher for most of the second half of the nineteenth century. Within 4 years of his conversion to christianity at age 15 he was preaching to audiences of over 10,000. Money poured in to support his ministry. He used this to set up homes for needy children. So there we were among 100 men and women who had grown up in an ‘orphanage’. One woman’s father died when he was working on the Ugandan railway. Her mother had to make her way back to UK with her four young children and find some way to earn a living – unable to meet the needs of her family. This ex scholar spoke of how happy her time at Spurgeon’s was – never bored, never hungry, always well fed and well dressed. And she also spoke with tears in her eyes of how becoming a mother herself helped her realise what letting go of her children had meant to her mother. She had always wondered why her mother did not look back when she left her at the orphanage. And she spoke of how lucky she was to have known the security of her Spurgeon’s childhood. Another man was rescued from an abusive family. For years he stayed in a corner at Spurgeons, not speaking and not participating. He gradually learned to trust others and now has a successful career and secure marriage. His comment was that he praised God for the fresh start the home had given him. BC and I drove home feeling deeply moved at how effective and significant C.H. Spurgeon’s vision to support the young had been. And, to top off the day, we chanced on Gareth Malone’s programme about giving young people from disadvantaged backgrounds the opportunity to sing opera with him at Glyndebourne. The Times reports this as “One of the most enthralling, informative and uplifting reality series yet made”. I wept as I watched. Gareth is taking young people who have a tough start in life with no self-confidence and little opportunity to better themselves. He is giving them a chance to explore their own gifts and talents. His belief in them is moving and inspiring. But not all respond to the gift he offers. Yes, stuff happens in our lives . . . and yet . . . if we turn our focus towards what we can do with what we have now, who knows what we can achieve in our own lives and in the lives of those around us? What if angels really do exist? The bible mentions angels more than 250 times and in 34 of the 66 books. Some appear as individuals and some in groups; in human form or as heavenly beings. They proclaim good news, protect against harm, and they appear as a heavenly host praising God. And what if angels really do exist today? Author Hope Price gathered the stories of ‘many hundreds of obviously sane down to earth people, who described their experiences with a mixture of awe and reticence. In almost all cases, the conviction that they have encountered angels is absolute.’ The angels appear as individuals or in groups; in human form or as heavenly beings. They proclaim good news, protect from harm, and appear as a heavenly host praising God. So, what if this is a pattern? What if angels are beings that reach out from heaven to earth. They were active in biblical times and are active today. We recognise what they are. We can see them, touch them and hear them. Going back to the metaphor from psalm 1, I explore the space around me and am curious to hear and see what might be there. 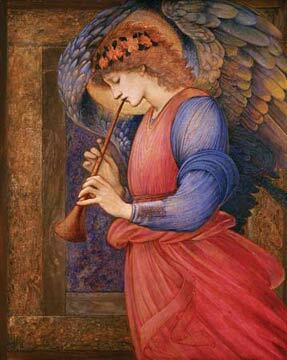 Can I imagine what the angels, archangels and all the community of heaven might sound like? As I reflect, I receive a gift from a friend – the music I need. He does not know I am looking for it. Lux Aurumque – Light and Gold. 4 minutes and 9 seconds. But we are busy and our focus is on the here and now. The average visit to a blog lasts 96 seconds. 4 minutes and 9 seconds is too long. And it is the same with prayer. We struggle against wandering thoughts and a short attention span. What would happen if we could open our awareness to spiritual things? Words cannot describe a spiritual experience. We have to do it. In Lux Aurumque we can see and hear and feel richness, height, depth, challenge, surprise, joy and pain. When you have time you can listen to Lux Aurumque by clicking here. And you might find that you wish it lasted longer . . .